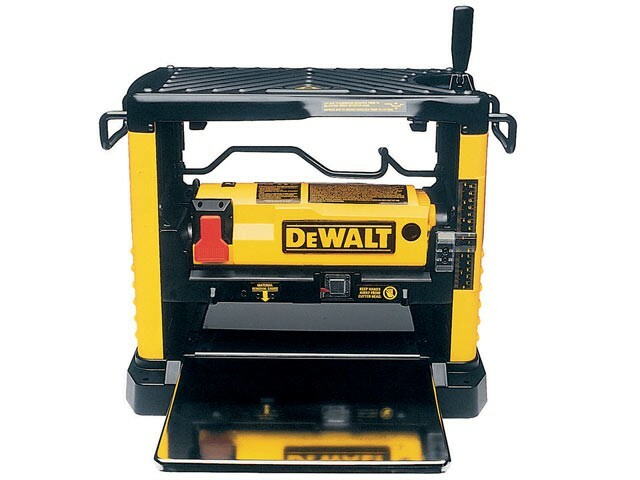 DEWALT DW733 Portable Thicknesser 1800 Watt 230 Volt head lock facility locks the cutter head into place to eliminate any movement in the cutter, providing a high quality surface finish. Large infeed and outfeed tables provide added material support when cutting large materials to improve the surface finish. Its 4 post column design allows the cutter head to move up and down smoothly and accurately. Designed for portability on the job site and in small workshops. The powerful 1800 Watt motor makes large surface planing easy, whilst holes located in the base enable the machine to be fitted to work bench. Has a thickness scale, material removal gauge and graduated depth crank make accurate planing quick and easy. Feed Rate: 8m/min, Max Planing Depth: 2mm. Size (H x L x D): 445 x 520 x 310mm.